Richwood Toys, Incorporated was a family run doll operation located in Annapolis, Maryland USA, who made hard plastic dolls in the late 1940s to 1950s. The Sandra Sue doll shown at left and below, is wearing a fabulous original outfit of a pale blue felt coat with matching felt picture hat, white lace dress and black high heel shoes. 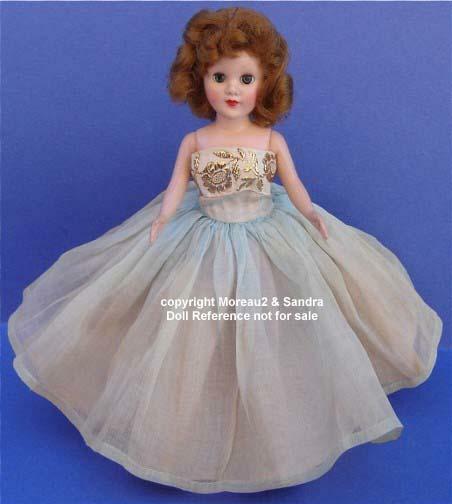 1950's Richwood Sandra Sue doll is 8-9" tall, made of hard plastic, sleep eyes, came as a regular doll or walking type, has a slim body, had either flat feet or high heeled, and has dark orange-brownish eyebrows and lashes, that help to identify this doll. 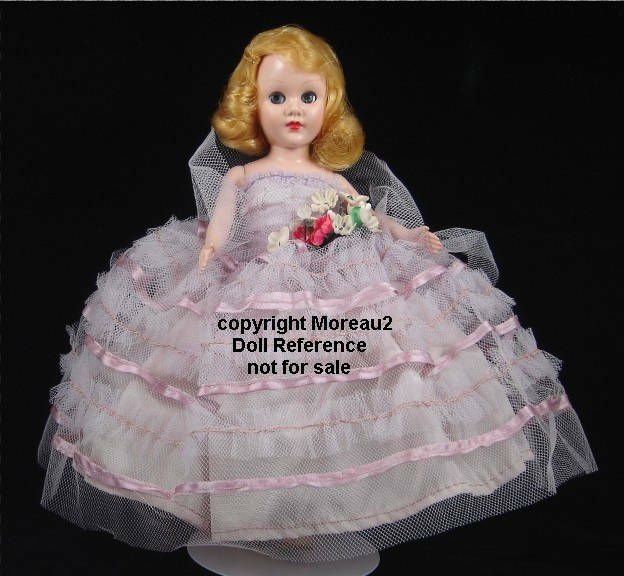 Dolls are marked under their arms or on their legs with a number. As a fashion doll Sandra Sue has and extensive wardrobe. 1950s Richwood Cindy Lou doll is 14" tall, made of hard plastic, has a jointed body, wigged, sleep eyes, closed mouth, used the Mary Hoyer doll mold and came dressed in many different outfits. 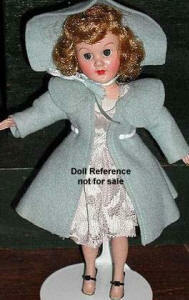 Doll is unmarked or marked: Made in USA inside a circle. 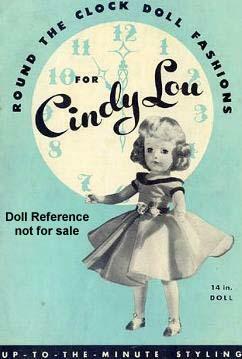 Booklet cover at right states: "Round the Clock Doll Fashions for Cindy Lou, 14" Doll, Up to the minute styling". Cindy Lou has her own webpage with lots of photo's and information. You will find lots more photo's a comparison of her to a Mary Hoyer doll and a look inside the Fashion Booklet. 1950s Richwood Tina Lou doll is 8-9" tall, hard plastic body with vinyl head, sleep eyes, molded painted hair, closed mouth, jointed baby body. 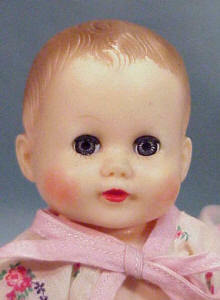 1950s Tina Lou doll 8-9"